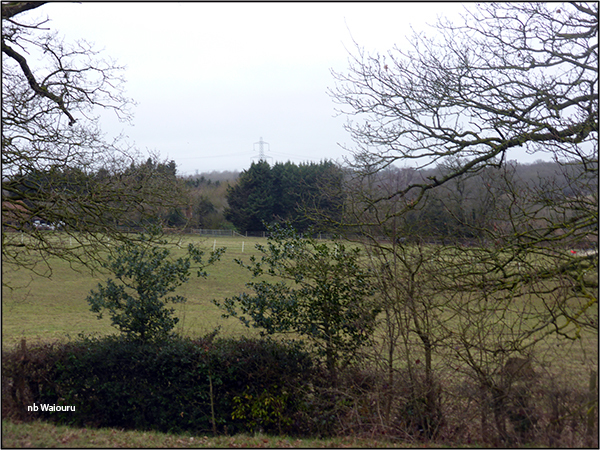 After looking at both the OS map and the OSM I decided on a circular walk to the west of Uxbridge. This would take me over the M25 Ring Road around London and also cover what appeared to be mostly rural countryside. The idea was to join the towpath south of Uxbridge for the last part of the walk which would provide an idea of the canal we will see when heading towards London. 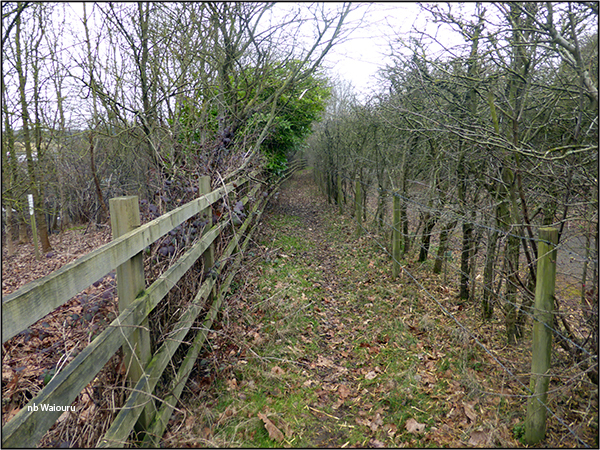 If I covered all the planned ground I’ll record four sections of public footpath not currently on the OSM. All this rural countryside within the M25. Whatever happened to the “concrete jungle”. 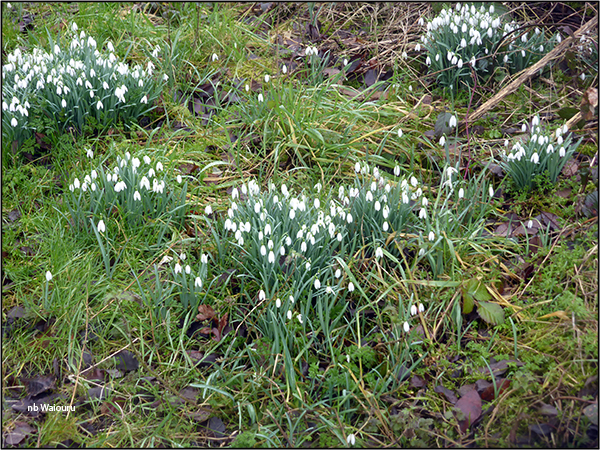 At the end of this footpath I came upon the first snowdrops I’d seen this year. The majority of the paths I walked look like they have very little traffic. 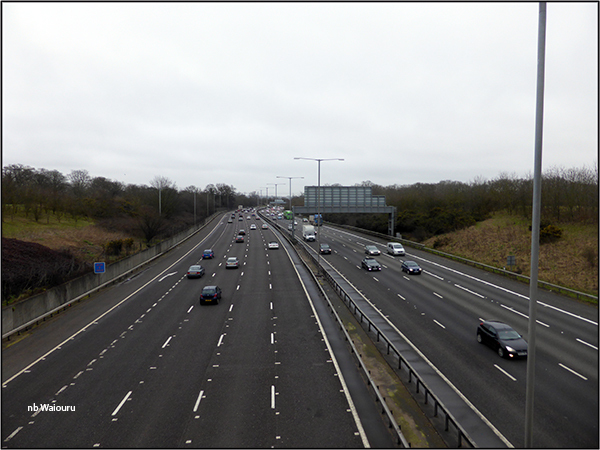 The rumble of traffic on the M25 got louder as I reached the furthest part of the route. 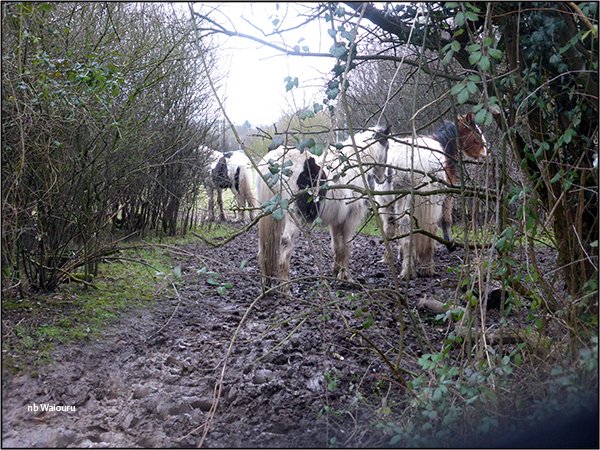 I’d just crossed a stile when Silver, Trigger and Black Beauty mistook me for Steve Jobs and came charging across the boggy water meadow. It was impossible for me to run through the mud so I elected to outstare them. This worked until I turned my back and Trigger decided to nudge me in the back. They followed me to the stream where I thought I could lose them by crossing the narrow footbridge. However they elected to wade the stream and wait for me on the other side. 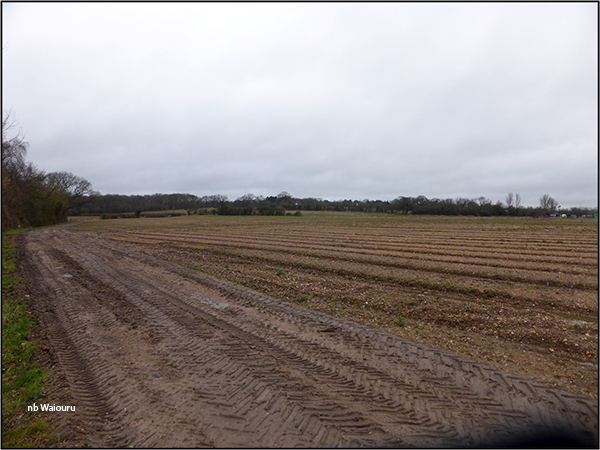 As you can see they have cut the ground up quite badly. In the end they decided I wasn’t Steve Jobs and no apple would be forthcoming leaving me in peace to cross the final section of water meadow to reach the path beside the M25. 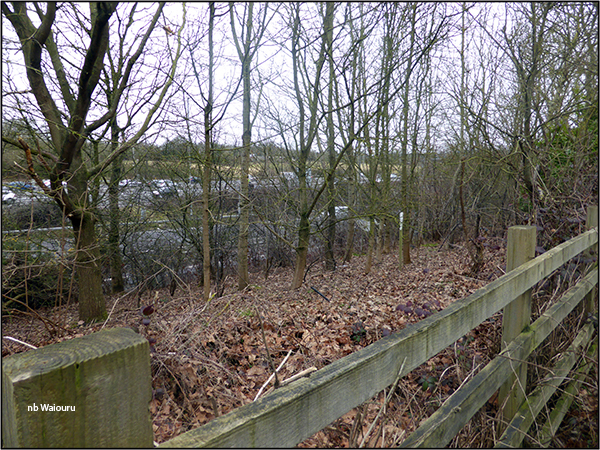 This looks like a quiet footpath until you realise there is a motorway beside it. This isn’t a quiet footpath and yet despite that squirrels and rabbits were observed oblivious to the road traffic. 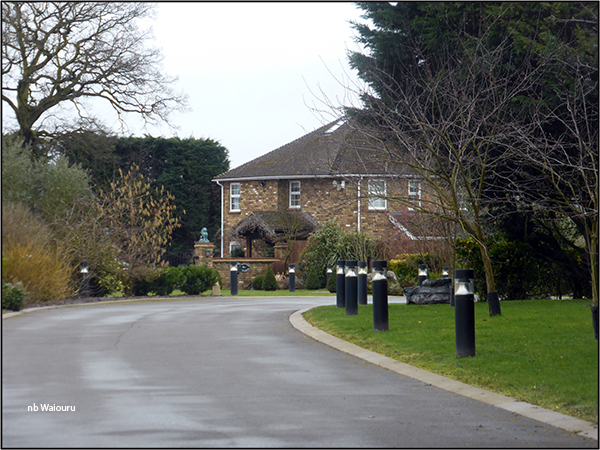 There are some rather large and affluent homes in this area. 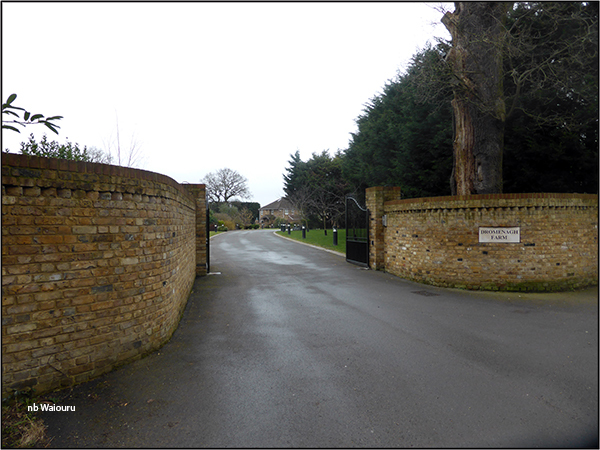 They all have beautiful entrances to the grounds (homes mostly out of sight) with large gates and signs advising CCTV coverage. This is the entrance to a farm house! I don’t know what crop he is growing but it must be worth a fortune! A closer look at the farmhouse. 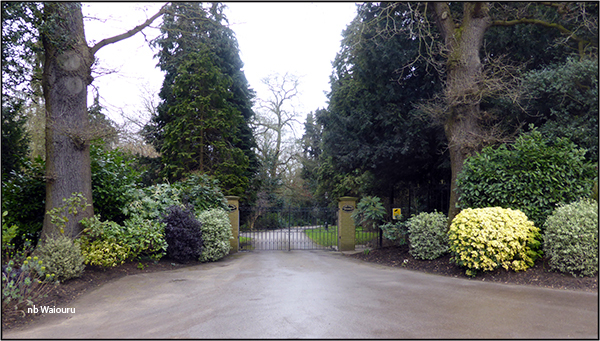 The entrance to the property on the opposite side of the lane also looked impressive. It was time to turn east and make my way back through the countryside to Waiouru. The ground around here was higher and consequentially firmer under foot. It’s still very rural. This narrow lane took me through what I initially thought was a group of old farm building but as I entered it I realised it was a complex of horse stables. Actually the majority of the “farm animals” in the area appear to be equine! Most of the stable staff were female and they appeared to be very willing to shovel sh!t. If we ever fitted a composting toilet I know who is biologically most suited to emptying it! I don’t usually pay much attention to birds (that fly). Plenty of eagles in Australia and hawks in NZ. So I surprised myself in taking a photo of this wedged tail, white eye, brown feathered booby. Of course I might have incorrectly identified it. No doubt blog reader Bill will be able to correct me if I have erred in my opinion! 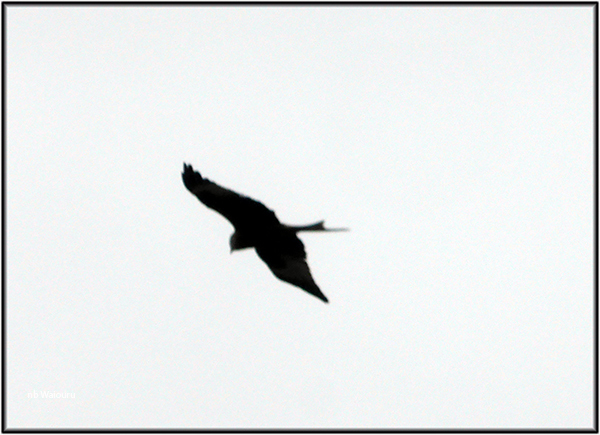 I'm pretty sure it's a Red Kite. The fork of the tail gives it away as most buzzards have slightly wedged tails. Looks like a Red Kite to me, there are a lot of them around. They were re-introduced 20 odd years ago in Oxfordshire/Buckinhamshire area. They spread further every year. With a forked tail, it's probably a Red Kite, reintroduced into the Chilterns in the 80's (I think) & are now well established.